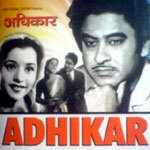 "Adhikaar" is a 1954 hindi film which has Kishore Kumar, Neeru, Usha Kiran, Radha Kishan, Balam and Baby Shashi in lead roles. We have 2 songs lyrics and 2 video songs of Adhikaar. Avinash Vyas has composed its music. Kishore Kumar, Geeta Dutt and Meena Kapoor have sung these songs while Raja Mehdi Ali Khan and Neelkanth Tiwari have penned its lyrics.